Please help Aptos earn “free money” by clipping, collecting & turning in “Box Tops” – it’s easy! Ask family, friends, neighbors & co-workers to save Box Tops for you, too. Each little pink “Box Top” is worth 10 cents. Box Tops are on many of the everyday items you already purchase. Participating brands/products include Ziploc, Kleenex, General Mills cereals (Cheerios, Chex, etc. ), Annie's, Betty Crocker, Hefty, Progresso, Nature Valley, and more. Turn in your Box Tops in the main office collection box. Thanks for your support! It’s easy to find Box Tops. In fact, you may have some in your home right now. 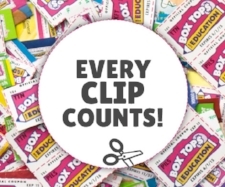 Clip Box Tops from your favorite products and turn them in to your child’s school today! Box Tops are each worth 10¢ and they add up fast! Encontrar Box Tops es fácil. De hecho, tal vez tengas algunos en tu casa en este momento. Recorta Box Tops de cientos de tus productos favoritos. Cada cupón de Box Tops tiene un valor de 10¢ para tu escuela ¡y esas cantidades se suman rápido!